Looking for a way to create an open and inviting ambiance for the upcoming holiday parties? Maybe you would like your house to be the meeting spot for all the social events you plan. Or perhaps you envision your home being the place where the family gathers and spends time together. At Home Mender Inc. we have an idea for making that vision a reality: open floor plans. Why not knock out a wall and give your house some room? Imagine cooking Christmas dinner this year while conversing with people in other rooms. No one misses out on conversation and the family truly gets to spend time together. 2. You can keep an eye on the kids. Spacious rooms allow parents to do household duties or cooking while their kids hang out in the same room. 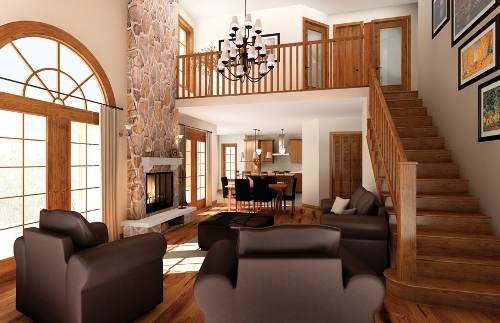 Removing interior walls means that sunlight from windows will permeate throughout the house. You are no longer stuck in the kitchen while everyone socializes in the family room. Now you can be a part of the group while you cook and serve food. Plus, having a spacious room allows for more seating options and buffet style dinners for your family and guests. Creating an open floor plan can be as simple as removing one wall that separates the kitchen from the great room or removing a couple of walls in order to combine two or three rooms. The process of removing a wall is quite simple and could be done in one or two days, making it a perfect improvement in time for the holidays. Home Mender Inc. believes that you can make your house a home by making small changes that will benefit you and your family. Partake in the holiday cheer and make room this year!